A Jukung is colourful traditional fishing boats that you see lining the coastal shores of Bali. At Amed and Padang Bai, we use them for Scuba Diving, they make it easy to do a backward roll and getting back on just pass your equipment up then use the ladder. These graceful vessels use only one main cloth sail and in favourable winds can skim them ocean’s surface at a fairly rapid pace. Most junking are fairly small and this enables them to be hauled out of the water and parked on the sandy beachfront with relative ease. 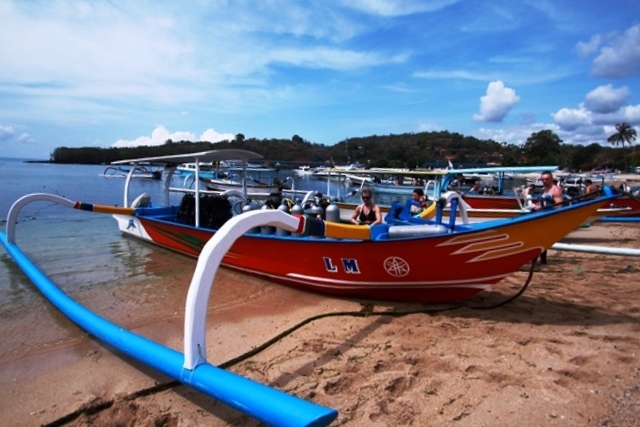 Originally these boats were used for fishing but now are also used for scuba diving and snorkelling. As with everything on this delightful island, a new Jukung must be constructed following a strict set of religious guidelines. When the specific tree chosen for the wood, it can only be cut down on an auspicious date in accordance to the ancient Balinese calendar and a special day is also sought for construction to commence. Once the Jukung has been fully constructed, it then undergoes a complex blessing ceremony. Offerings of rice, flowers and fruit are presented to appease the Gods and the Jukung is sprinkled with holy water by a priest before it is considered seaworthy. The jutting bow is decorated with an image of the mythical Gajah Mina (elephant fish) with its fierce bulging eyes to ward off evil. The spirit of Gajah Mina is also though to bear the power of night vision and guide the jukung through all sorts of weather conditions. In the late 1980s there was a race of over 1000 miles in open outrigger canoes by nine crews, who travelled from Bali to Darwin across the Timor Sea. It was featured by the National Geographic Society as “The Great Jukung Race”.